Oh, boy. Unleash the controversy. In Game 4 of the ALCS between the ​Boston Red Sox and Houston Astros, things got really tricky in the bottom of the first inning. With two men on base and Jose Altuve at the plate, the ball got blasted to right field by the Astros second baseman for what seemed like a surefire home run. 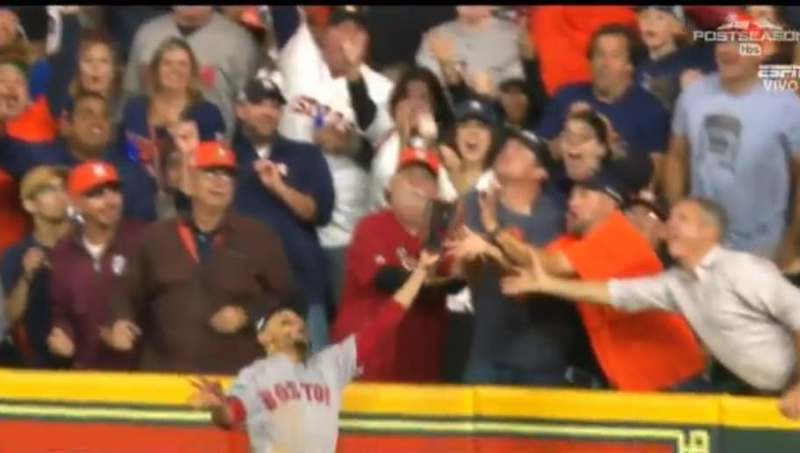 The only problem is that a fan got involved in the play as outfielder Mookie Betts attempted to reach into the crowd. After commiseration from the umpires, the play was ruled fan interference. The homer suddenly was no more. And it looks like Boston got a gift-wrapped out from what should have been a go-ahead three-run homer by Altuve and Houston. As you can see, the ball appears to have cleared the plane of the wall through the air. Betts' glove hits a fan as they simultaneously reach for the ball as it comes down and the umpires ruled Altuve out, but the rules say that interference only applies if a fan reaches over the wall. I'd love to hear the explanation for that. Didn't look like a fan reached over the fence. If he didn't, and the ball was over the fence when it was touched, and the contact was incidental between the fan and Mookie Betts' glove, that has to be a home run, right? That says it all, folks. The fan made incidental contact with Betts and did not appear to reach over the fence while doing so. By rule, this should be a home run and a lead for the Astros. ...but the umps (and most likely several Sox fans) disagreed. While we can't be 100 percent on the call, the one sure thing we do know is that talks surrounding this play won't be ceasing for a long while, especially if Houston ends up losing Game 4.